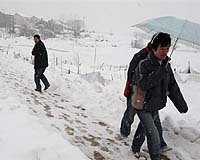 Beijing (AFP) Jan 25, 2010 - Thirteen people have died in China's western Xinjiang region from the worst snowstorms in six decades, state-run Xinhua news agency reported on Monday, amid warnings of more freezing weather to come. The blizzards and bitter cold that have pummelled the region near Central Asia since the beginning of the year have also left 1,168 people ill or injured, the report said. China has endured an unusually harsh winter, reaching its height since January 1 with heavy snow across vast parts of the north and west, with Xinjiang suffering the hardest from the Siberian cold fronts. Twelve of the dead were killed by avalanches while one died from exposure, Xinhua said. Nearly 1.42 million people have been "affected" by the weather, with 162,000 people evacuated, it said. China's state-run television has carried daily images of driving blizzards raking the vast region amid government efforts to rescue people and livestock. Touring hard-hit areas at the weekend, Premier Wen Jiabao promised special subsidies and discounted loans for livestock herders to help them recover from the cold crisis. The state weather bureau on Monday forecast more bitter cold for the next two days. More than 40 people have died this week as eastern and central Europe battles a Siberian cold snap that has cut power and roads, disrupted air travel and stranded whole villages, officials said Monday. Snow has blanketed swathes of western Turkey, Bulgaria and Romania, with lows of minus 35 degrees Celsius (minus 31 Fahrenheit), while Poland has again been gripped by a deep freeze that has killed more than 200 in the country since November. An ice and snow front moved Monday into Germany causing the cancellation of more than 200 flights out of Frankfurt airport -- Europe's third biggest international air hub -- according to the airport management company. In Bulgaria, schools remained closed on Monday in many eastern towns while rescuers fought their way through four-metre-(13-feet-)high snowdrifts to bring bread and other necessities to cut-off villages. Temperatures plummeted to minus 34.4 degrees Celsius in central Romania where roads were cut and dozens of trains cancelled. Twenty-two people have died across Romania since the start of the cold snap five days ago, the health ministry said. "Most of them were elderly, homeless people," junior minister Raed Arafat said on Realitatea TV channel. With no let-up in view before Wednesday, authorities are struggling to get thousands of homeless people into shelters. In Turkey, five people died after a fierce snowstorm caused power outages at the weekend in Istanbul, while further west near the Greek and Bulgarian borders, villages and major roads were blocked by snow. Snow was expected to reach up to 35 centimetres (14 inches) in some parts of Istanbul, a city of 14 million, according to the natural disaster coordination centre. In Bulgaria, three people died at the weekend as officials recorded minus 29 degrees Celsius in the northern town of Glavinitza, and Monday was set to be the coldest day so far this winter. In Poland temperatures as low as minus 35 Celsius claimed 11 lives over the weekend, police said Monday, taking the toll since November to 202. Most of the victims were homeless men aged 35 to 60 under the influence of alcohol who refused to stay at shelters for the homeless, police spokeswoman Kamila Szala said. "This winter's death toll is tragic -- despite constant police warnings and aid to people at risk," she added. Police believe alcohol also played a part in the death of a 13-year-old boy who suffered hypothermia near his village home in Glowienka, south-east Poland. "We know that Kamil was drinking alcohol Saturday with his 15-year-old brother and 16-year cousin, who both went home to alert parents," a police spokesman told AFP. "The parents alerted the police Sunday morning, when it was already too late." Weather forecasters have predicted more severe sub-zero temperatures across Poland in the coming days. And eastern Germany was bracing Monday for night-time lows of minus 17 degrees Celsius, in a winter that has already killed 13 homeless people across the country according to a national shelter group.